The Aisne department is in the east of Picardy and has long borders with the Ile-de-France, Champagne-Ardenne, Nord-Pas-De-Calais and a tiny one with Belgium. The northeast contains part of the Ardennes mountain range while the rest of the countryside consists of wooded plains and lush valleys. The department's name comes from one of the River Oise' tributaries that cross it. The culture, and especially the cuisine, has been largely influenced by the Champagne region. Laon, home to just 25,000 people, is the former capital of the Carolingian Empire and now the departmental capital. It was founded on a hill and so is divided into an upper and lower town. The upper town contains a fabulous cathedral, preserved wall defences, medieval streets and superb views over the surrounding area. The lower town, meanwhile, has been entirely re-built in the last half a century following complete destruction in the war. To get between the two you have the choice of climbing 427 steps or hopping on a cable car. St-Quentin was another town that suffered during the war. Fortunately however, the most impressive buildings have been spared. The Basilica and Hotel de Ville, both fine examples of Gothic architecture are well worth seeing. The re-building has not been hurried, is well laid out and largely incorporates Art Deco styles. The town is situated on a hill, which has its own underground network of caves. There is also an extensive waterway and railway system that makes the town a major trading hub with Paris, the northern coast and countries to the east. 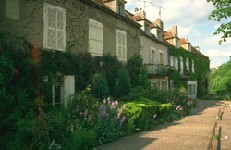 The relaxing town of Soissons, towards the south of the department, has retained its rural atmosphere, situated as it is, in the middle of rich farmland. There are numerous parks and public gardens set among the ancient buildings. The most prominent is the Abbaye de St-Jean des Vignes from the 11th Century. Chateau-Thierry in the very south was the home of the brilliant 17th Century poet, La Fontaine who has curiously been dubbed 'the least serious man in France'. The town is within Champagne-producing country. If you want to fly then the nearest airports are the Paris airports. Alternatively you could arrive by ferry in Dieppe, Calais or Dunkirk or simply take the Channel Tunnel to Calais. Investment by the French government has seen a rejuvenation of the north, coinciding with a rise in people wishing to live there. There is still a great deal of affordable property in the area. At the time of writing we have a detached two-bedroom house in the countryside for €137,000. Do you know Aisne better than we do? Do you have photos of Aisne? Aisne is in the East of the Picardy region.